THE MGOAUCTION IS NOW OPEN! 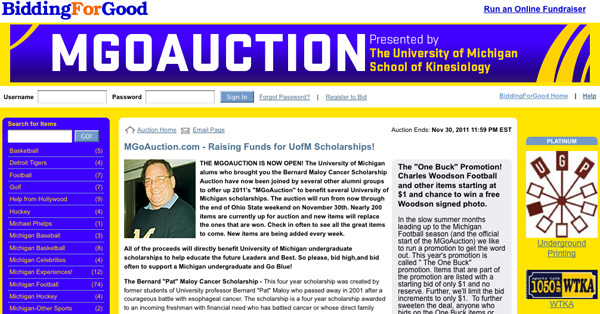 The University of Michigan alums who brought you the Bernard Maloy Cancer Scholarship Auction have now been joined by several other alumni groups to offer up 2011's "MGoAuction" to benefit several University of Michigan scholarships. The auction will run from now through the end of Ohio State weekend on November 30th. Nearly 200 items are currently up for auction and new items will replace the ones that are won. Check in often to see all the great items to come. New items are being added every week. All of the proceeds will directly benefit University of Michigan undergraduate scholarships to help educate the future Leaders and Best. So please, bid high, and bid often to support a Michigan undergraduate and Go Blue! That banner will remain on the site for the foreseeable future. Buy cool things. Help kids go to Michigan.